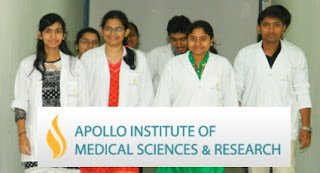 Apollo Institute of Medical Sciences and Research (AIMSR), Jubilee Hills, Hyderabad is one of the latest medical colleges in Telangana State. The college is offering MBBS course of 4 years and 6 months duration and one year compulsory rotating internship. Following are details of Apollo Medical College, Hyderabad. Category - A seats will be filled through NEET ranks based counseling. Category B and Category C seats (management quota) will be filled by the college management. 2) Certified copy of the memorandum of marks of the qualifying examination. Affiliated University: Kaloji Narayana Rao University of Health Science, Warangal, Telangana.